A Dutch woman officially recognised as the world's oldest person has died at the age of 115. Hendrikje van Andel-Schipper died in her sleep at the care home where she lived, the director of the centre said. 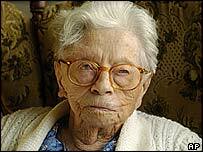 The former needlework teacher was born in 1890, and often said her long life was down to a daily dose of herring. Mrs van Andel's husband died of cancer in 1959, but she continued to live on her own until she moved into the retirement home at the age of 105. Commonly known as Hennie, she entered the Guinness Book of Records as the world's oldest person in 2004. Her successor is another 115-year-old woman, Elizabeth Bolden of Tennessee, in the US. The oldest man is Puerto Rican Emiliano Mercado del Toro, 114. Johan Beijering, director of the care home where Mrs van Andel lived, said she had remained mentally alert right up until she died. But she was aware of her increasing physical frailty in the days before her death, Mr Beijering said, recalling some of her final words. "It's been nice, but the man upstairs says it's time to go," she told him. Mrs van Andel was a passionate football fan, and supported Ajax of Amsterdam, the Netherlands' leading team, for most of her life. She married a tax inspector in the 1930s and sold her jewellery for cash during the German occupation of Amsterdam in World War Two. "I eat a herring every day and I drink a glass of orange juice every day for the vitamins." Mr Beijering said she was grateful for all her friends and the way people cared for her over many years. "She felt that being the oldest person in the world for more than a year was long enough."